It's still January, and I'm still on an organizing kick. I talked here about getting my schedule and my life in order, and wanting to keep this trend going through the year. I knew that this meant the next big thing I had to tackle was my desk. In general, if I'm not careful, I can tend towards a messier organization style. I'm not sloppy, but I start piling papers on top of each other and creating pile after pile and things start to spiral. Some of this is because there are so many surfaces that I can actually reach. This means that cute shelving units, file cabinets, and bookshelves are all out for me for things that I actually want to reach easily. But I know that I can't blame it all on my reaching abilities (or lack thereof). I like when things are organized... I just don't like the effort required to keep it that way! But I feel so much better when it's done, and I knew it was time. It's harder to decide what to keep and where to put things when you're trying to organize while the mess still exists. I took all the papers off my desk (there were a lot!) and sorted them into piles on my bed - things that needed to stay on my desk, things that could be thrown away, and things that needed to be saved, but not on my desk. I also collected the 5-10 small journals/notebooks on my desk (I have an obsession), kept one or two out, and put the rest away for now. This is what I do when I'm organizing my closet, too, because it keeps you from getting overwhelmed. So first, I dealt with all the papers on my desk, which took the most time! But I also had some gift cards, old birthday cards that were too cute to get rid of, random cords that didn't go with any devices I currently use... I dealt with each of these one at a time. 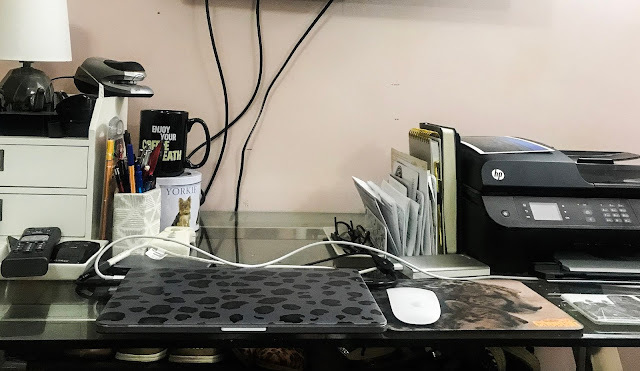 My desk (this one) doesn't have any drawers, because they usually end up blocking my wheelchair from being able to fully ride underneath the desk, so I have to get creative with storage. I have a few on-desk storage things, like an mail sorter to hold my important/time sensitive papers, but mostly, I have to sort and prioritize! I decide what I need to be nearby, and the rest can be stored somewhere else that I can't reach without help. If all else fails, bribe yourself! I knew I needed somewhere to put the cute birthday cards I mentioned above, plus other keepsakes that I don't want to get rid of but also don't want to keep sitting on my desk. And I'm always motivated by the thought of buying new room decorations online, so I scooped up this cool magnetic bulletin board to display my things!